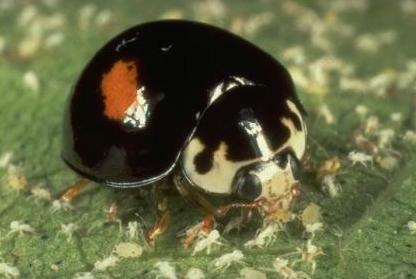 Region: This lady beetle is primarily found in the western United States, but can also be found throughout North America. Life cycle: This lady beetle will produce numerous generations each year. The adults will overwinter in well-protected places. Physical Description: This lady beetle is commonly gray to pale yellow with black markings and is about 1/4 inch long. The eggs are orange in color and are laid on stems and leaves, while the larva are black with yellow markings on the tip of its head and ranges from 1/2 to 1 inch long. Feeding characteristics: This lady beetle, adult, and larvae, eat many varieties of aphids. Purchase Lady Beetle's at Organic Garden eStore.